Heynckes: "You need to adapt, and we did"
Munich - The men in charge of Germany's top two clubs agreed that their teams had been pushed all the way before respectively coming out on top on Matchday 11. For their counterparts elsewhere, it was the habitual mixture of satisfaction, relief and regret at opportunities missed. Bruno Labbadia (Stuttgart): It's a brutal defeat for us - it's so hard to take. We played some sensational stuff in the first half and deserved to lead. We started well after the interval, but then did exactly what we didn't want to do against Hannover. We played into their hands and lost our shape. It really hurts. We've got to give ourselves a kick up the backside. We're really disappointed. Mirko Slomka (Hannover): Stuttgart were easily the better side in the first half. The last last few weeks have shown us we need to take things into our own hands and take the initiative. We talked about this at the break and made a few tactical changes. It worked and we had the belief. After that, we played really well going forward. We're really happy to have won. Mike Büskens (Fürth): We wanted to make Gladbach work from the off, and it went well for us early on. The game was going well until the twelfth minute. After the sending off it was really hard for us against a team that's so good on the ball. We let them level for 2-2 too early and we caved in. It is what it is - a bitter defeat. Lucien Favre (Gladbach): Fürth are an awkward team to play against. It was important to win here, that's for sure. We reacted well to going a goal down, but at 1-1 expected too much and lost our patience. After the break, we wanted to make it 2-2 quickly. In the end it was deserved. Lorenz-Günther Köstner (Wolfsburg): When you have to wait until 11 November for your first home win, you can imagine what it means to us. Everyone could relax after Diego made it 1-0. I was proud of our first-half display. After the break we kept our concentration and didn't make any mistakes. Sascha Lewandowski (Leverkusen): In the first half we were poor in all areas. We were below-par in all the things that we had been doing excellently in the last few weeks and were completely off the pace. To be fair, it's only the second time since I've been here that we've come away from a game very unhappy. Now we want to come back from this defeat stronger. 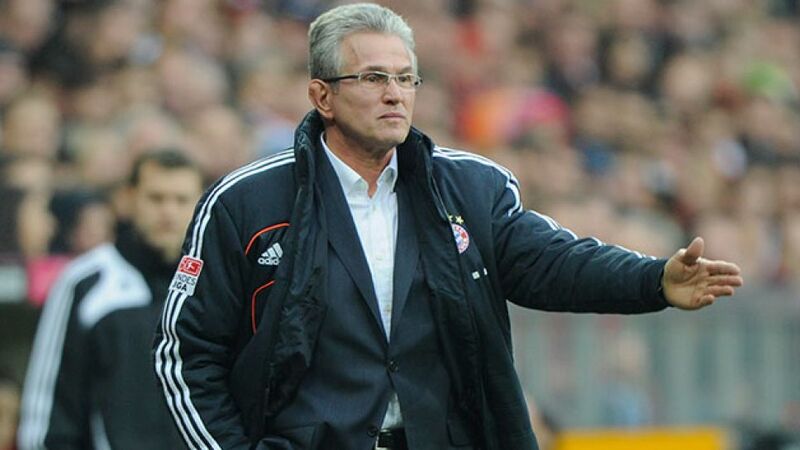 Jupp Heynckes (Bayern): It was a hard-earned win. It's not always easy to switch back to the Bundesliga after playing in the Champions League and we could easily have found ourselves a goal down. We didn't perform with our usual conviction, but if you can't get your normal game up and running, you need to be smart and adapt - and that's what we did. Armin Veh (Frankfurt): It was an intense, fast-paced contest. What really annoys me is the way we were caught out on the break from our own set-piece shortly before half-time. The penalty settled it and that really knocked the wind out of us. We got no reward for our efforts, unfortunately, but then again we were up against opponents in a league of their own. Markus Weinzierl (Augsburg): I think it was a brave, committed performance from my team. We played very well in the first half and posed a real threat up front, but we're not making the most of our chances and not rewarding ourselves for the incredible effort that's being put in. We need points, that's all that counts. Jürgen Klopp (Dortmund): It was a really tough test. It was a very tight contest in the first half. We scored a wonderful goal and Augsburg had one or two chances themselves, which Roman Weidenfeller dealt with superbly. There was a clear improvement after the restart. We carved out two nice goals and after that we controlled the game. The 3-1 win wasn't undeserved in the end. Huub Stevens (Schalke): Obviously, you're up against it if you go behind to a team as strong as Bremen, but we battled back, just as we did against Arsenal. The team have fantastic character and we worked hard for the bit of luck we got at the end. Thomas Schaaf (Bremen): Once again, unfortunately, we're heading home after a very good performance with nothing to show for it. We had our opponents under control for an hour, but made too little of some good situations. We can be very satisfied with the performance, but not with the result. Christian Streich (Freiburg): A few of our players were carrying knocks, so we decided to play a bit deeper than usual, not least because Hamburg have such a strong team now. After the sending off [of HSV's Paul Scharner in the 35th minute, ed.] we didn't respond very well initially . The final 25 minutes were better, but we didn't take the chances we created. Thorsten Fink (Hamburg): We played well in the first half and could have been 2-0 in front, but the red card threw our plans into disarray. Last season something like that would have knocked us for six. I'm satisfied with the team's defensive performance in the second half. Given the run of the game, a point will do me. Norbert Meier (Düsseldorf): We were well organised. It can be tricky when you're a man up. After four defeats on the trot it was important for the team to take something out of this one. You have to accept that you're not going to be carving out a constant stream of clear-cut scoring opportunities. Markus Babbel (Hoffenheim): The result is fair enough. A man down [Marvin Compper was sent off in the 51st minute, ed. ], we were able to defend well, but we took a long time to get a grip on the game in the first half. The sending-off was a wake-up call for the whole team. Thomas Tuchel (Mainz): I'm very satisfied. We dominated the game for the best part of half an hour. Then we shifted down a gear and allowed Nuremberg back into it, and after that it was a battle. We came closer to scoring in the second half, so all-in-all we deserved the win. Dieter Hecking (Nuremberg): Obviously, going 2-0 down in the first 20 minutes wasn't part of our gameplan. We came up short in two crucial one-on-one situations. After that, we performed the way we'd meant to from the start. It was a very committed contest in the second half. But given that the first 20 minutes are part of the overall package as well, we can't complain about losing.